Fountain Lakes is located in Estero FL. A gated community of single family homes, villas & condos west of 41. Enjoy the 9 hole golf course at Fountain Lakes, the pool room, tennis courts, jogging path, volleyball courts, bocce ball courts. Close to shopping, fine dining, beaches and the Ft. Myers International Airport. Many of the homes in Fountain Lakes are situated along a private lake or natural wetland preserve area. There are a variety of homes, coach homes and villas avaibable in Fountain Lakes. The chip and put golf course gives home owners the opportunity to shore up their game before playing on one of the 150 area courses. 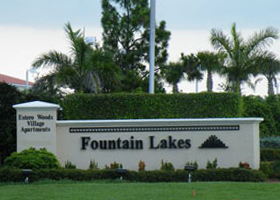 Fountain Lakes offers some of the most affordable living in the Bonita-Estero Area in a nice neighborhood development.